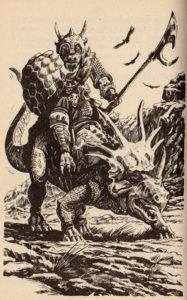 The Fighting Fantasy gamebooks by Steve Jackson and Ian Livingstone were blockbusters of the era. 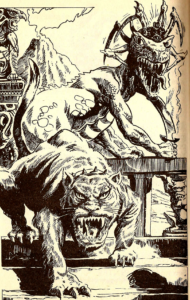 Join us on the seventh adventure, travelling to the Island of the Lizard King! Everyone I have mentioned it to has very fond memories of it. And I remember getting a copy of it for Christmas one year, a year I also got Scorpion Swamp. I do remember that IofLK was damn good though, so it seems I agree with people who I’ve mentioned it to. It’s just that I’m damned if time hasn’t scrubbed the reasons as to WHY it was good from my mind. Let’s refresh my memory on it, shall we? An old friend gives you a ride on his boat to the island, and you promptly begin the adventure. The island boasts a wide array of landscapes visible even at this early stage – we can see forests, we’ve heard of the mines, and there’s an ominous smoking volcano in the distance. Will we live to see it up close? Me and my old friend, whose parents evidently hated him enough to name him Mungo, start to explore the beach. 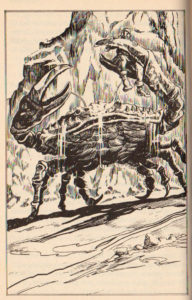 I find a ruined old hut, and while I’m on my way to check it out, Mungo manages to get crushed in the claws of a giant crab, thereby fulfilling the unwritten rule that any companion you find in a Fighting Fantasy game will quickly die a tragic and horrible death. I kill the crab, and Mungo gets to have a few last words before he dies. Tragic music plays. Let us take a minute of silence to remember poor Mungo… Okay, enough of that. Digging through the hut, I find a note left by a previous inhabitant who tells me that many of the plants on the island are poisonous and that he advises drinking from a bottle of anti-potion that he left behind. I give this a few gulps and then make camp for the night. The book details the cacophony of wildlife noises on the island, and I’m impressed with how atmospheric it all seems. If you’ve ever seen the end of ‘Cannibal Holocaust’, then you’ve a pretty good idea what’s about to happen. My stamina is beaten down to single-figures very easily. And even though I’m able to snarf down some meals over the course of the next few segments, I still feel rather sore. It was pretty rough to send three headhunters at me so early in the adventure. Still, it isn’t long before I manage to encounter a rather friendly figure, in the guise of a former prisoner who has taken to living in a small hut in a tree. I use ‘friendly’ in the loosest possible way, because the first thing he does is throw coconuts at me. He then demands that, to earn his friendship, I give him three of my meals, and in return he gives me a lock-pick and tells me that I should follow the general direction to the volcano. Would anyone mind if I threw him to the cannibals? Instead I decide to scrub my face with leaves, which seems to take away the pain and ease the sensation. Feeling much better, the book then asks if I still want to eat the toxic evil death mushroom. I say “Sure” and snarf some of it down. In a shocking twist, I am then violently sick – who’d have ever suspected THAT would happen? Coming to the next clearing, I find a strange glowing crystal standing alone in a patch of sunlight. There are no trees growing near it, so I do the sensible thing and whack it with my sword. My sword breaks, reducing my skill points. Not particularly surprising, really. I’m offered the change to touch the weird glowing crystal, and I decide that this will be a bit of a laugh. Rather than setting me on fire, it actually heals me. What an odd little item. I leave it where it is and continue on my way. 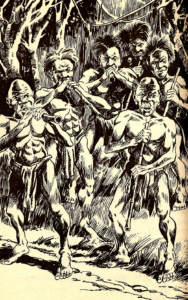 Soon after, I am confronted by a small crowd of pygmies. They shout at me and point blow-darts at me, but I’m not in the mood to try to fight them. 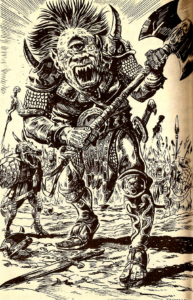 Instead I offer them some items – namely a small ax I’d found earlier. It seems that they regard this item as a sacred artifact, perhaps the pygmy version of Excalibur or something similar. In return, they give me some berries. Not a fair deal, but at least I’m still alive and haven’t been shot with darts yet. If only they could give me something other than the gnawing feeling of awfulness at the racial representation of their characters, yeesh. So I follow it. And guess where it takes me? If your answer was “into the lair of a vicious two-headed Hydra that eats you” then you might be right. There is a fight, but I don’t stand a realistic chance. I’ll be honest though, the actual mechanics of the fight is pretty good, as it’s one of those early instances where you have to fight two monsters (ie, both heads) at the same time. But with my damage to my skill I’d taken earlier, I just don’t stand a chance. I wonder if both heads wound up arguing over who got to eat me….So, let’s see what was lurking down the other path, shall we? 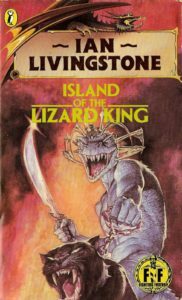 The following parts are a little bit of an expansion to this post, because Island of the Lizard King is such a decent book, it deserves to be looked into a little bit more, eh? It’s at this point when the atmosphere really starts to ramp up. We see an escaped prisoner, desperate to flee from the lizard men’s prisons. I take him onto the raft but, in his delirious state, he attacks me and I need to punch him into the river’s flowing currents. Before too long, the river brings you to a small village built of sticks and mud. Seeing a few lizard man guards, I realize that the mines are nearby, full of prisoners I need to rescue. Abandoning my raft, I soon find a tunnel that leads its way down into the mines. I manage to silence one of the lizard men guards, and find my way into a central tunnel. Cause of death: Crushed by the guards during a slave uprising.